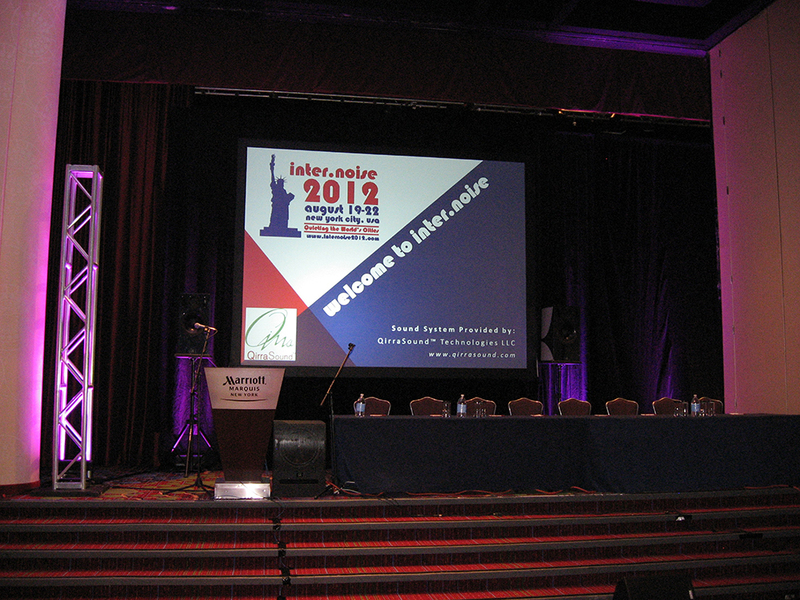 Qirra Sound handled the sound at the Internoise 2013 conference in New York. The conference was held at the Marriott Marquis hotel located at Times Square in New York. The company that was supposed to handle the sound had ten men on the spot who had worked for two days and had a huge truck filled with equipment. Qirra Sound had two “small pallets” with speakers: 4 small speakers and a subwoofer and it only took one hour to install the equipment for two persons! The room has seating space for over 2000 people and it was acoustically complicated. With only two speakers that covered the scene and two speakers located at the stage edge we could accomplish an even sound for the complete venue. Those who sat all the way down, stated that it was perceived as the speakers and performers “stood right in front of them.” Although the microphone at the podium was standing right in front of the speaker, no feedback was created. World-leading acousticians and sound specialists attended the conference and many of them were “scratching their heads” and wondered how this was possible. The Jazz Group that was playing was lyrical. The conference was a success. Thomas Lagö handled the sound.